Of course, with one less location and at least four fewer events per month, the Monthly Scoreboard is going to look a little different. Teams will appear more often, and may very well appear less often as well! Still, as we begin 2017 it is a HIGH SCORING MONTH, with a new location All-Time High Score which ranks as the second-highest anywhere! Girls Gon Git It top the Monthly Scoreboard for January 2017 with 217.5 points at Hitch, on January 23rd! Not only is it the new All-Time High at the location, topping their close friends Tiny Tim's... but yes, there is only one (well, two, including the Chips Era) other score that tops it! 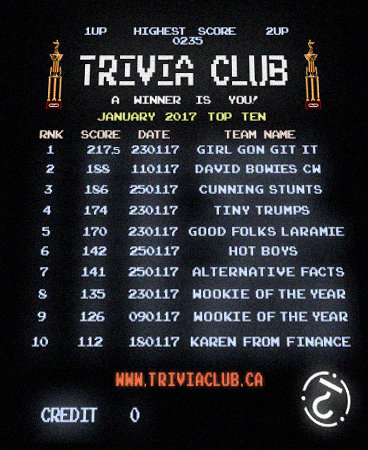 With 188 points, on the first Cardinal Rule event of 2017, David Bowie's Corporate Whores topped the board and attained January's high score at the location! In terms of High Scores per location, it's an even split with five scores taking place at Cardinal Rule and five scores taking place at Hitch. Four of the five top scores from teams competing at Hitch in January, actually took place on one night! January 23rd! Two days later, the 25th of January at Cardinal Rule put three teams on the Top Ten! The eleventh highest score of the month, barely missing the January Scoreboard, belongs to the Cunning Stunts and their 106 points on January 18th. The Mean Team for January, the high score closest to the scoreboard average, are The Good Folks from Laramie Cigarettes.